Clearfield Rotarian and Assistant District Governor, Cal Thomas, is shown receiving a Paul Harris Fellowship “multiple pin” from Club President, Joe White. When Rotarians contribute additional gifts to the Rotary International Foundation Annual Fund, they can receive a pin with multiple stones on it. 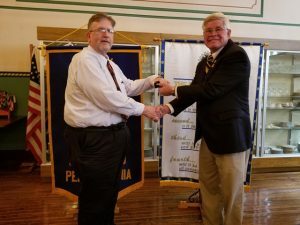 Rotary meetings are held at 12 p.m. Wednesdays at the Moena Restaurant in downtown Clearfield. Anyone interested in learning more or joining the club is asked to attend a lunch or to contact a Rotarian.